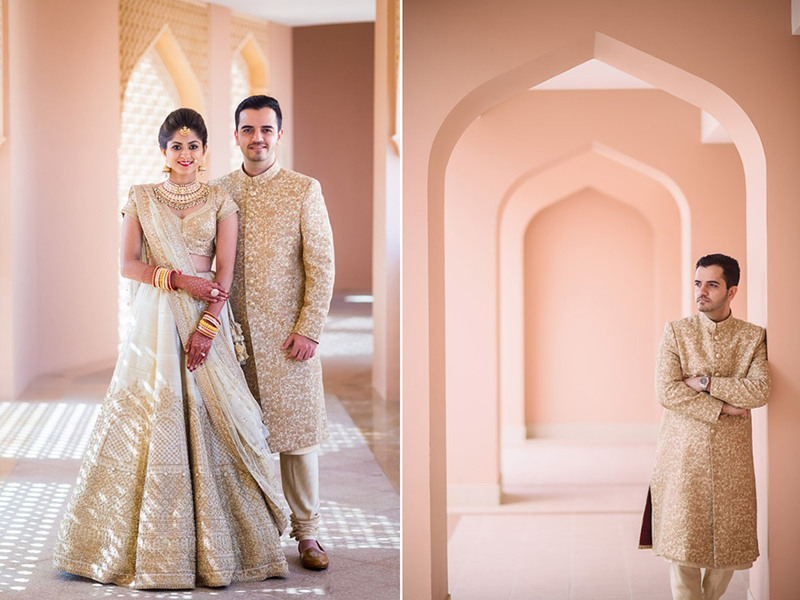 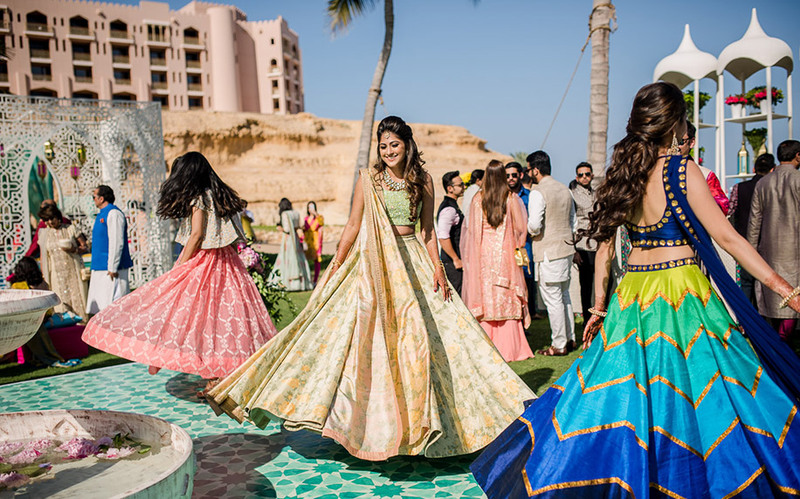 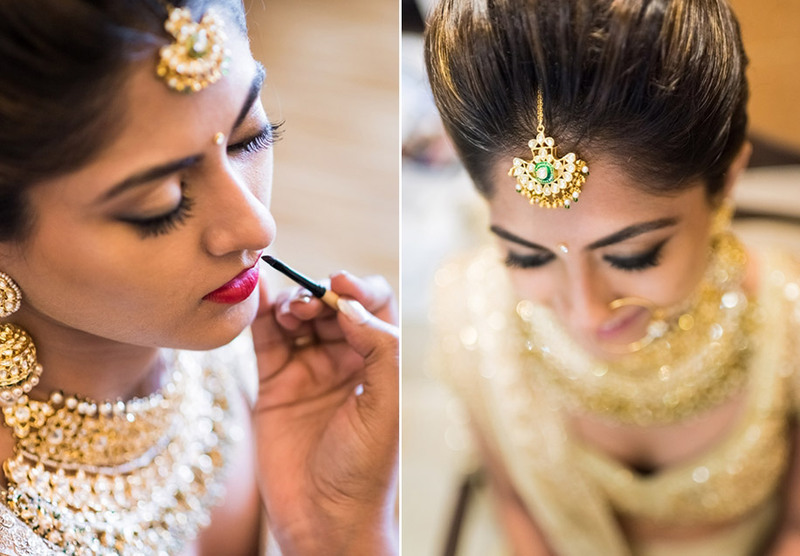 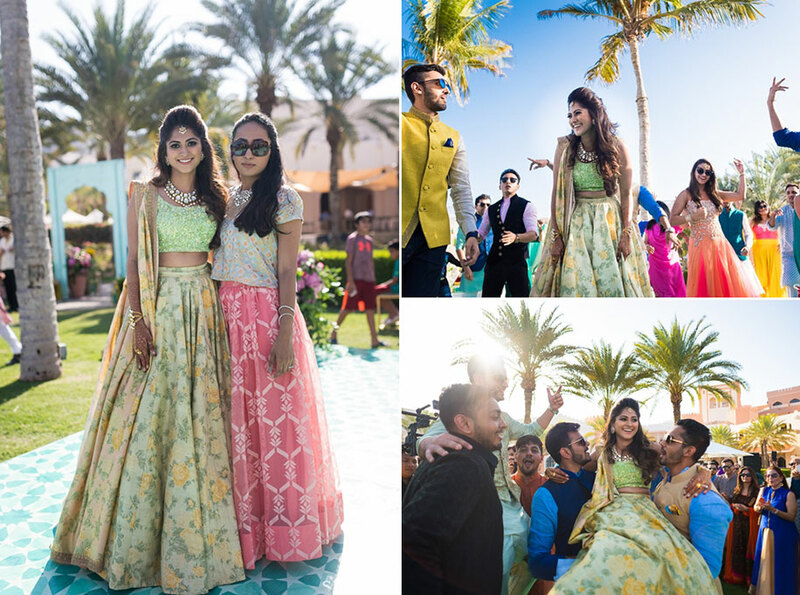 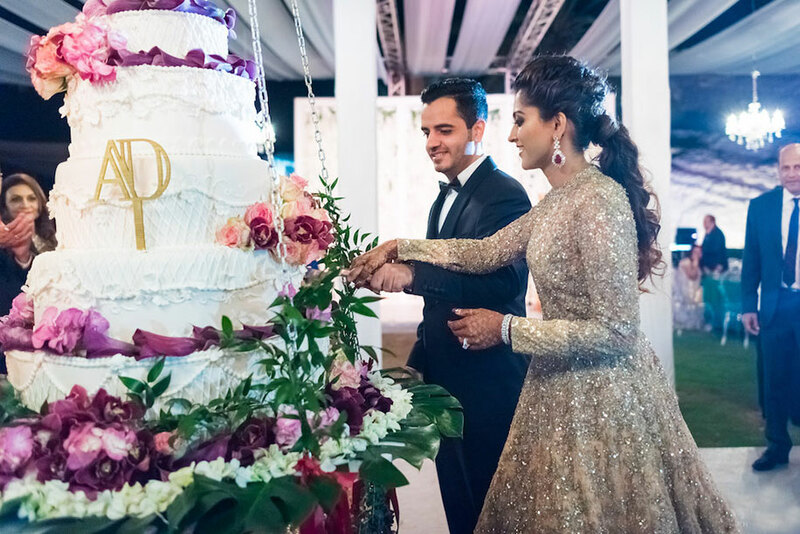 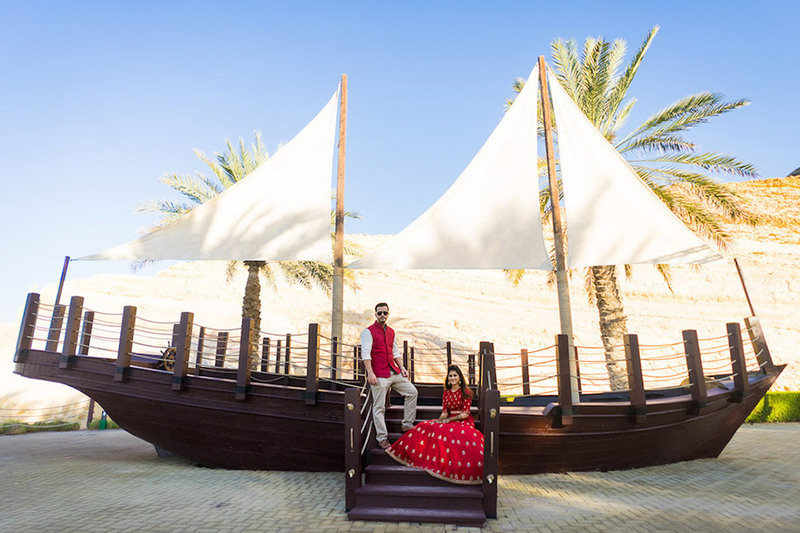 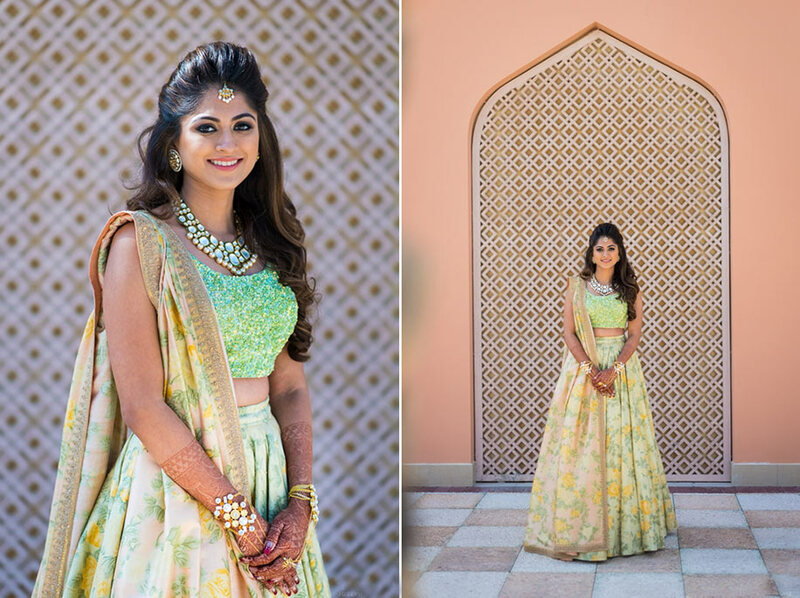 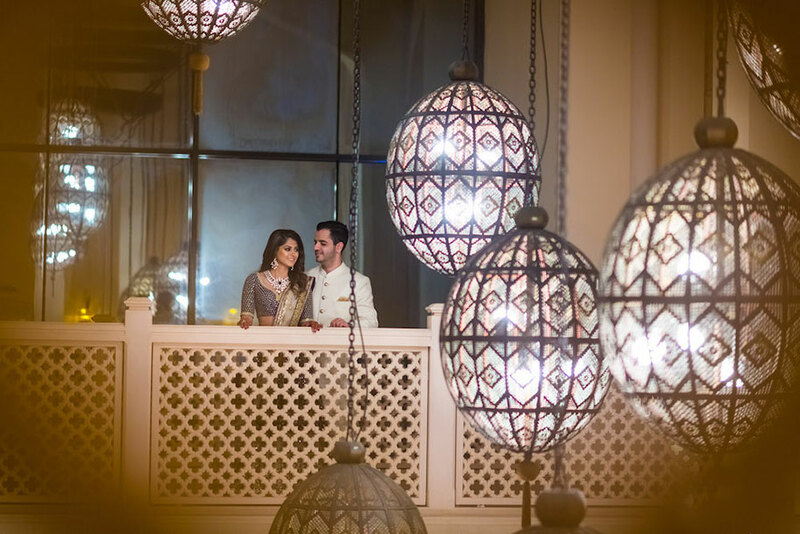 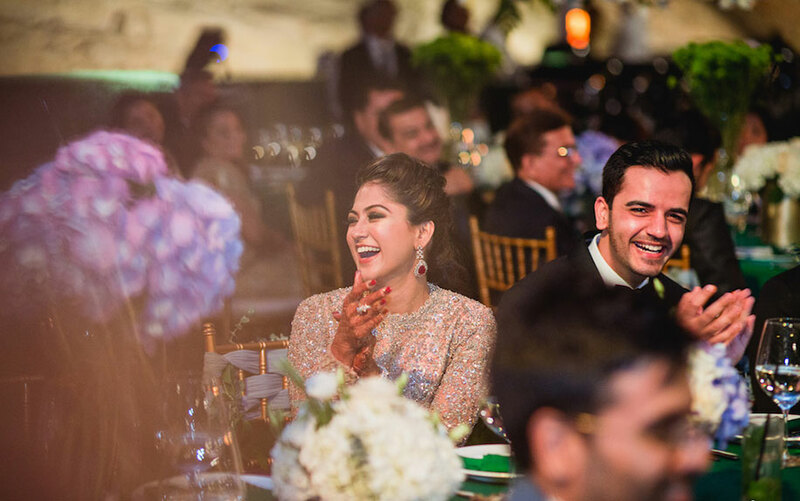 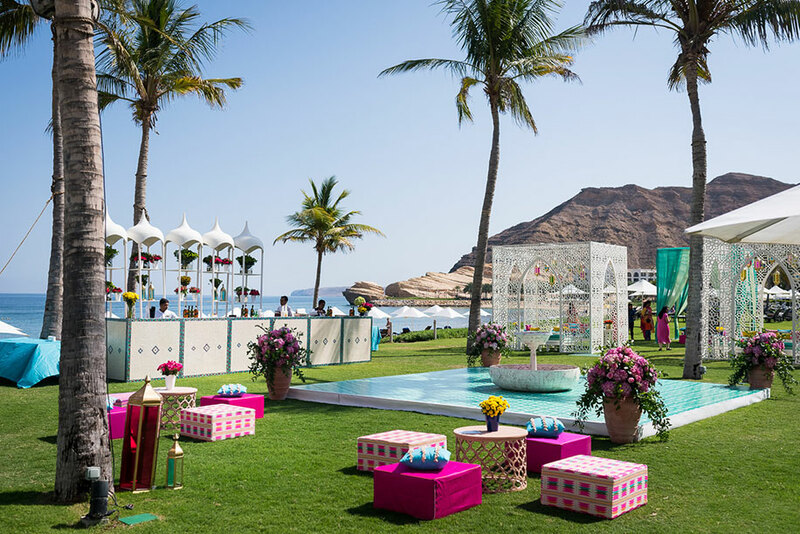 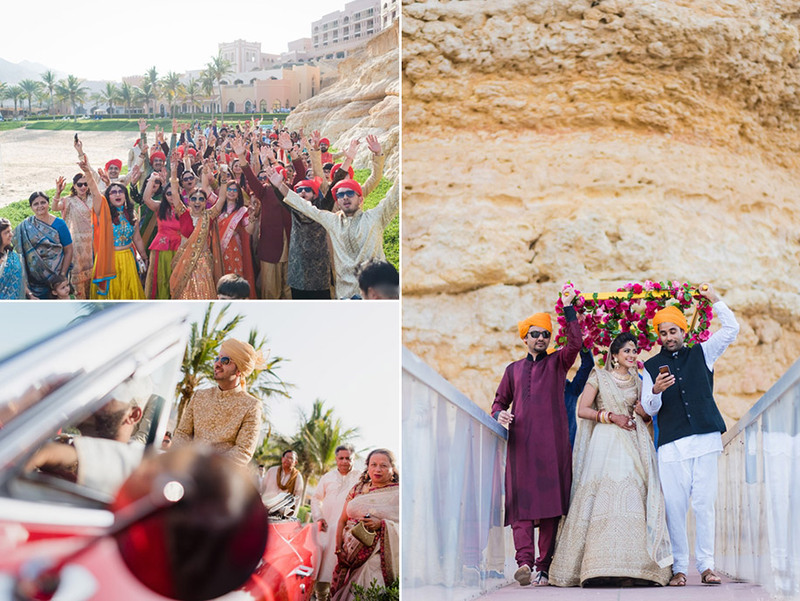 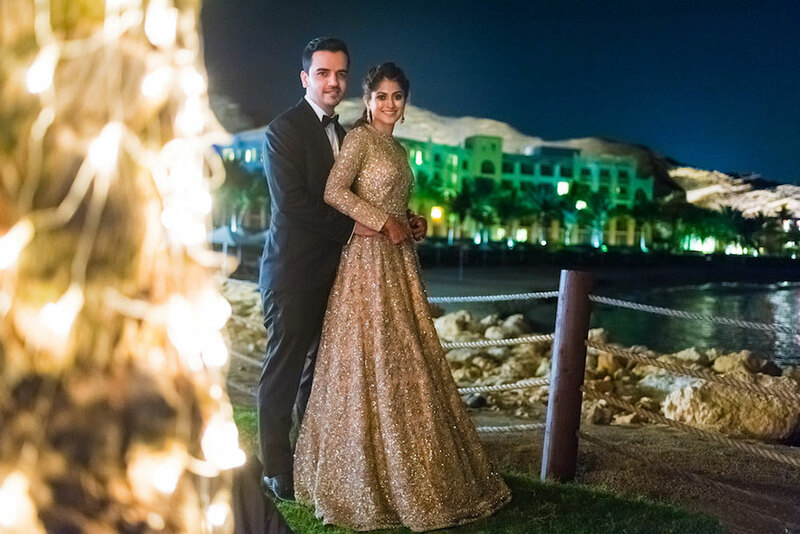 Anusha and Dhrumil’s perfect beachside destination wedding included elements that were inspired by the rich history and architecture of their stunning venue, such as arches, harps and magnificent backdrops such as the sea and mountains. 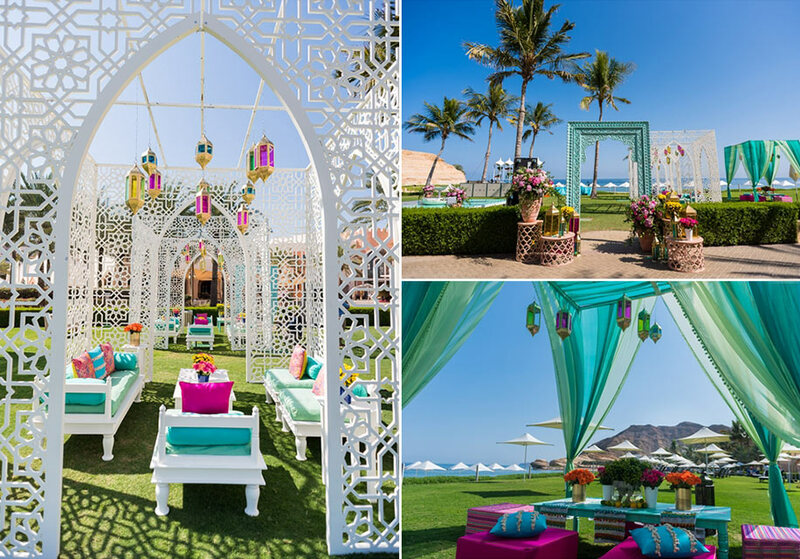 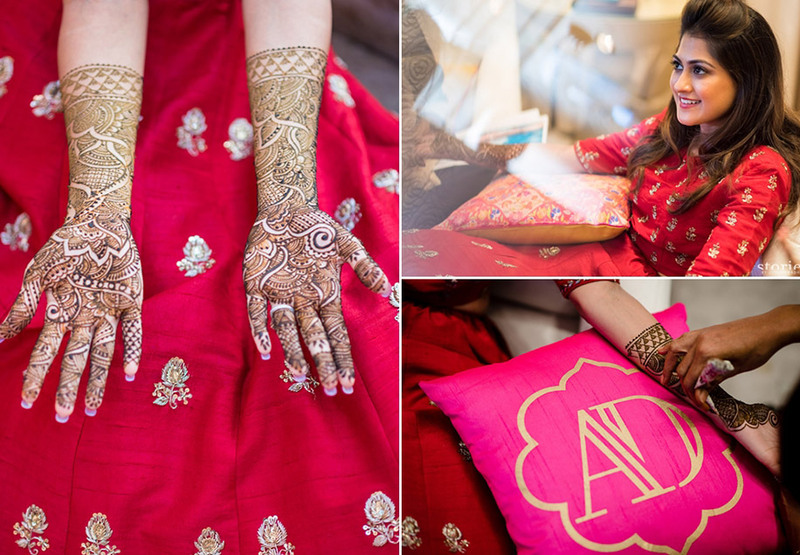 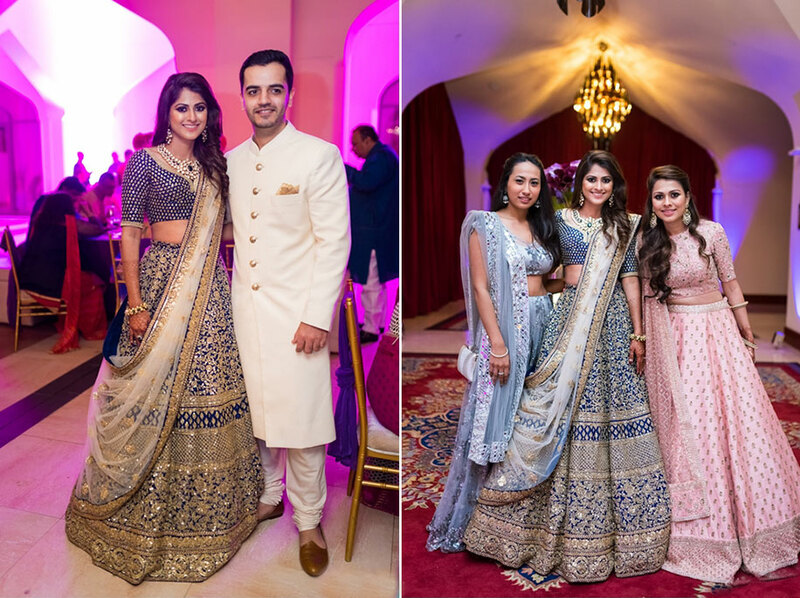 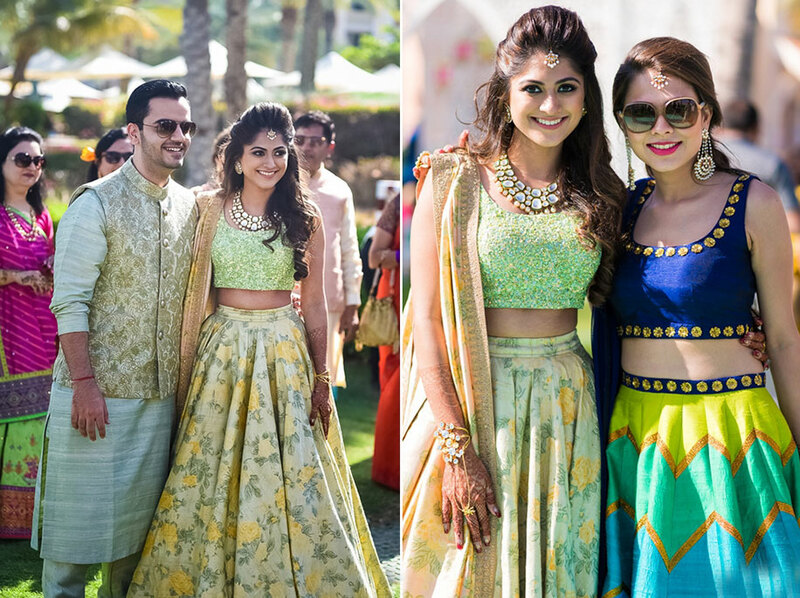 “The wedding decor was specially curated by our own company, Jam Designs and Devika Narain. 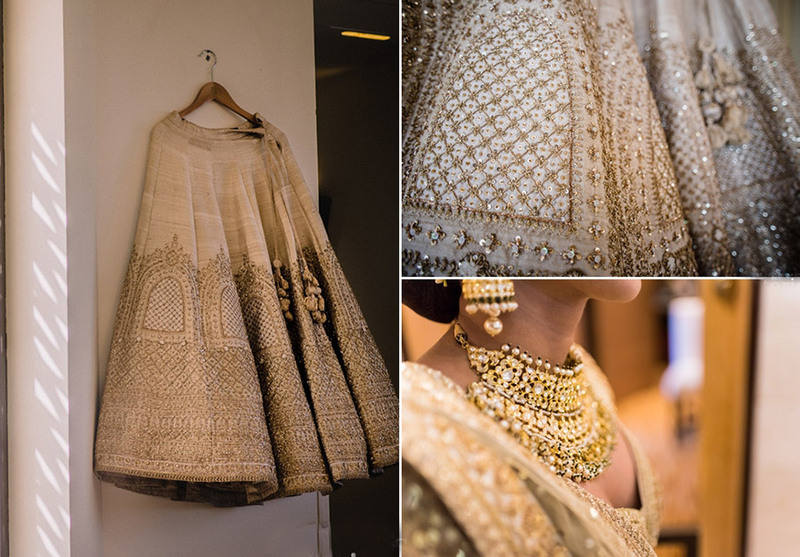 “We tried to create a feeling of chic royalty, one that represents new-age ‘maharajas’ (kings). 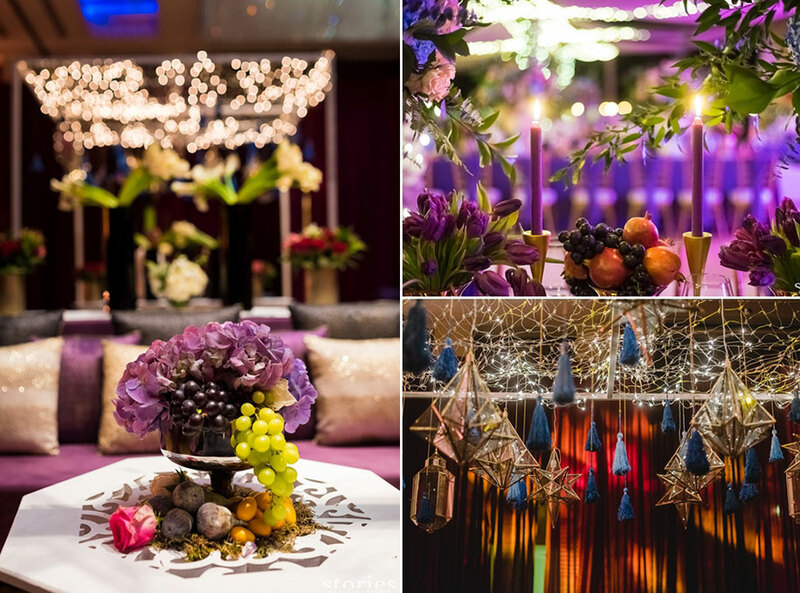 Therefore, the decor for the sangeet was kept minimal yet opulent. 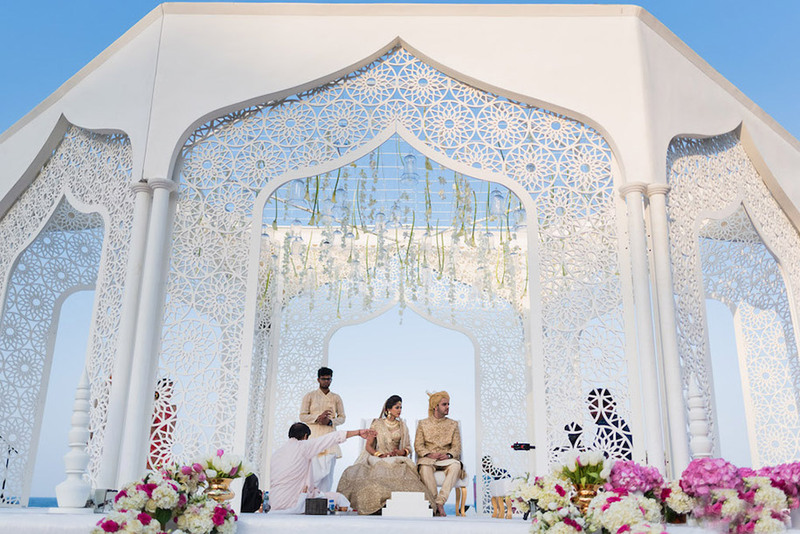 The center stage represented ancient Arabic architecture with ‘jaalis’ and arches. 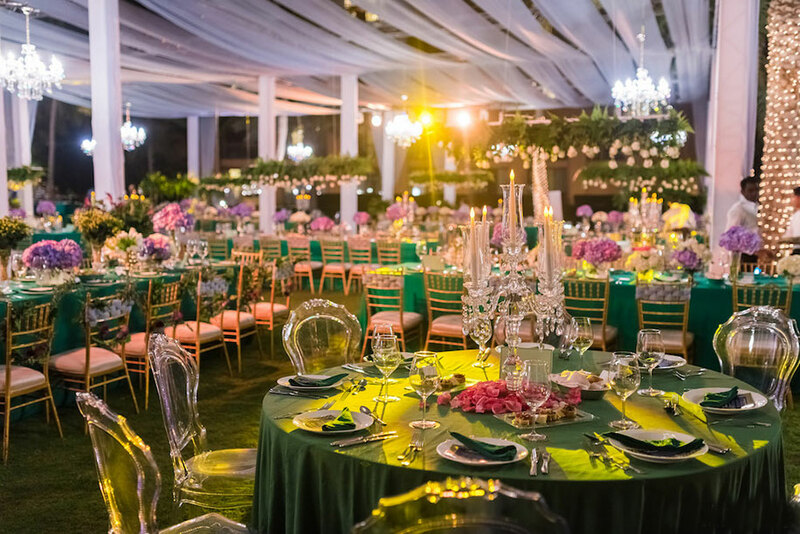 The tables were decorated with flowers and candles. 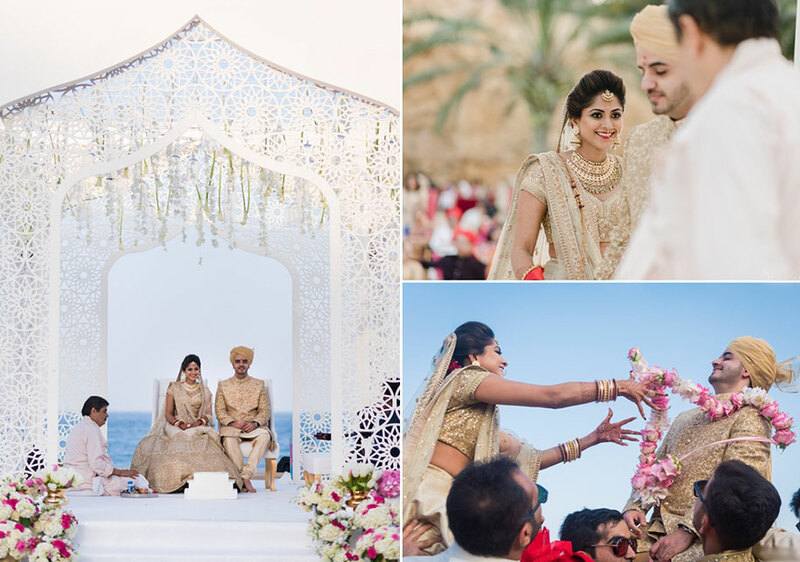 “The wedding was held at Turtle Beach, which in my opinion is one of the most beautiful beach spots in the world! 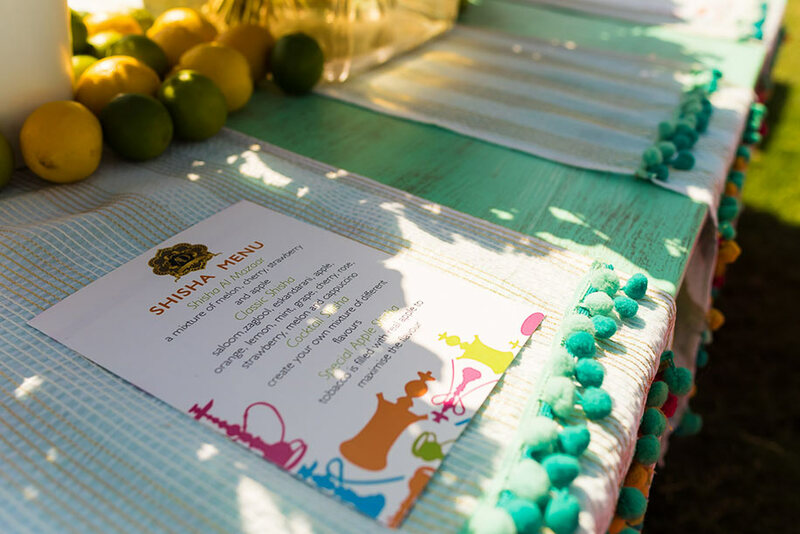 The function was a beautiful blend of old and new elements. 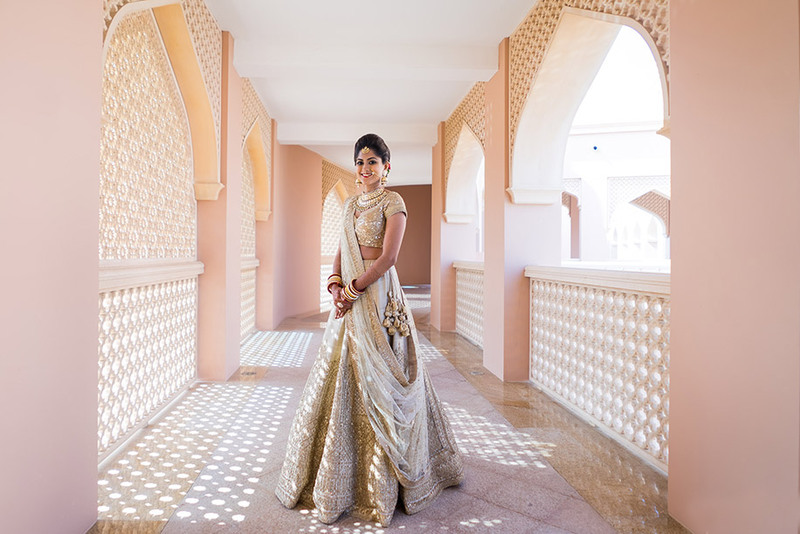 We wanted the decor to exude elegance while keeping the traditional element alive. 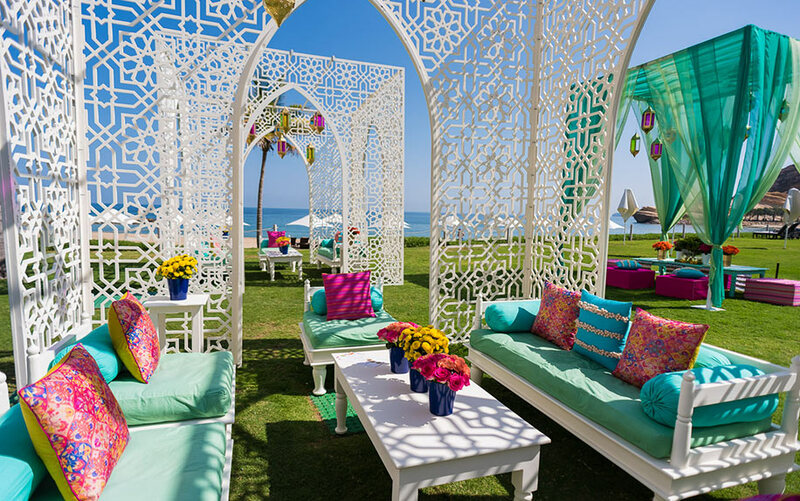 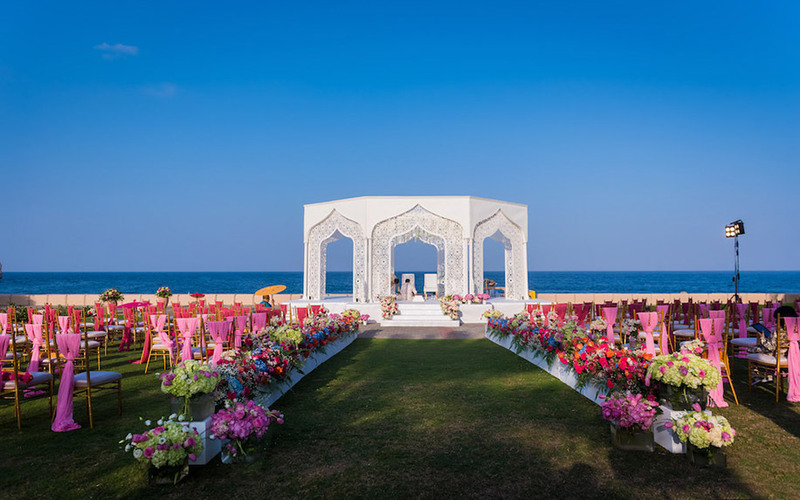 Our mandap was set up against the majestic backdrop of the sea and was decorated in romantic florals. 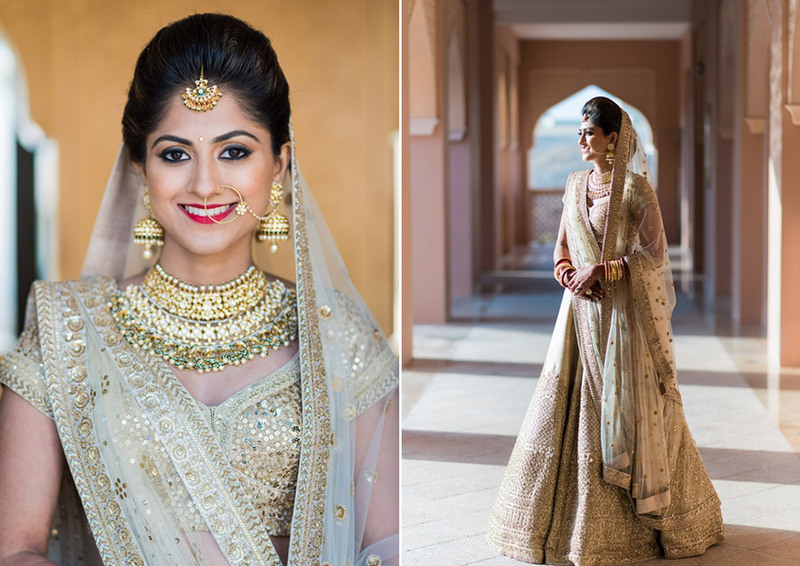 I was dressed in a beautiful dull gold Sabyasachi Masterpiece which I accessorized with a gold polki set with jhumkas. 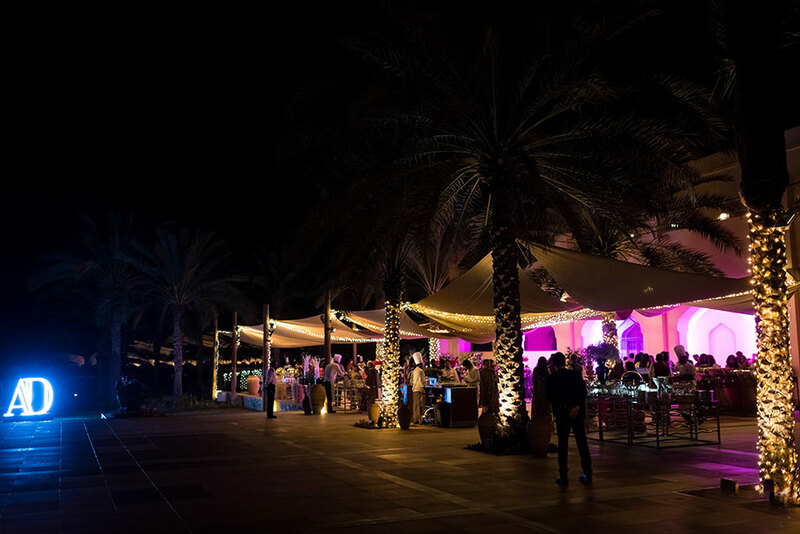 “We hosted our reception dinner on the sandy beach which was surrounded by beautifully lit mountains as the backdrop. 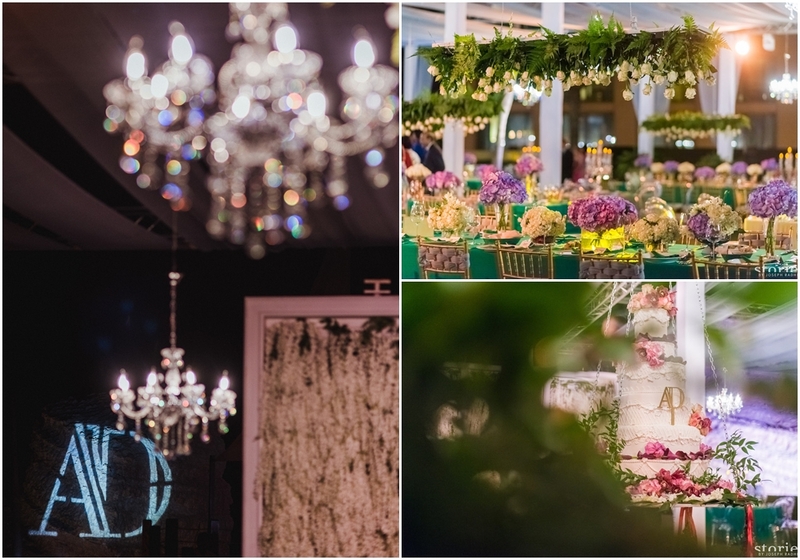 The dance floor had a giant floral ceiling with a cake hanging from the middle. 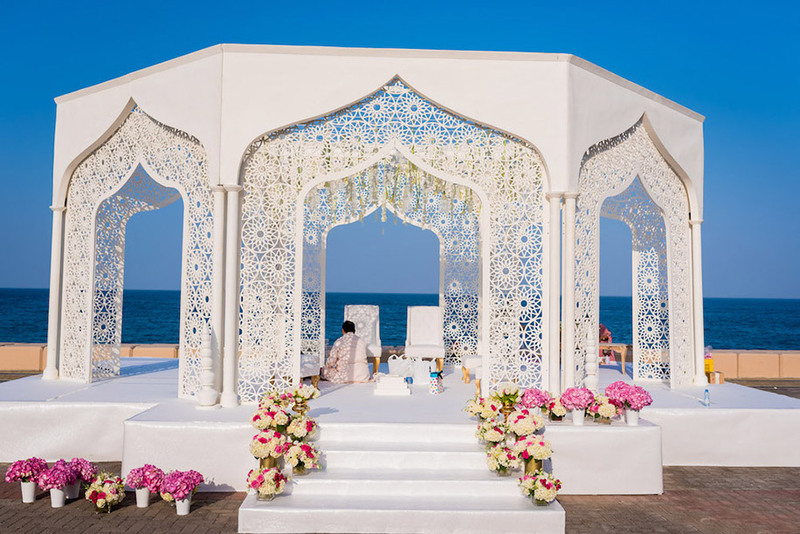 The magical sounds of the waves and harp were beautifully interspersed by various toasts, a few tears, cheers and warm smiles. 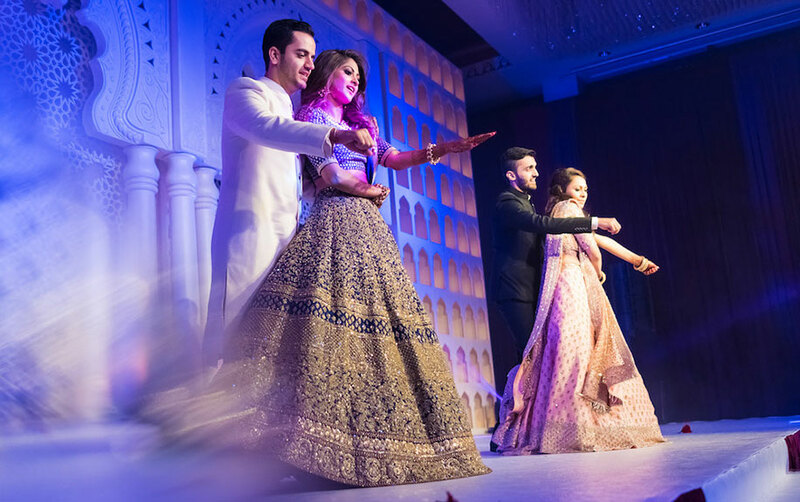 To complement the glitz and glamor of the night, I wore a beautiful powder pink gown by Sabyasachi Mukherjee along with ruby diamond earrings. 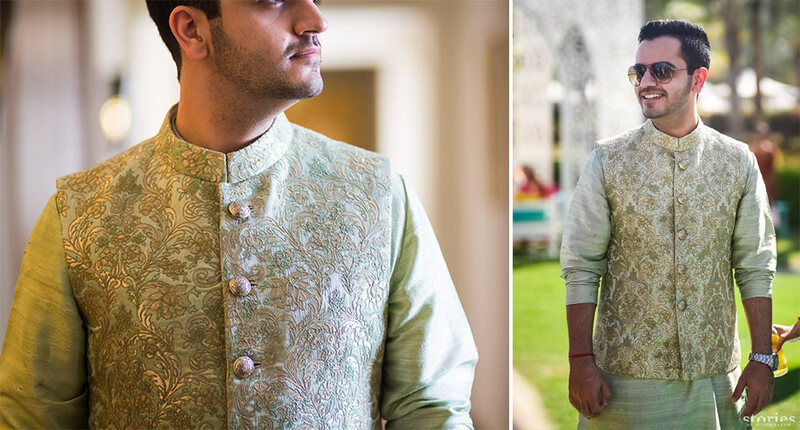 Dhrumil on the other hand donned a suit from Canali. 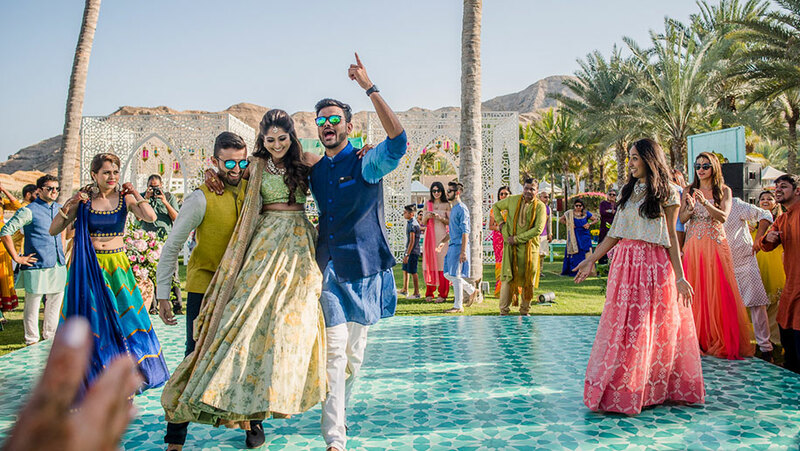 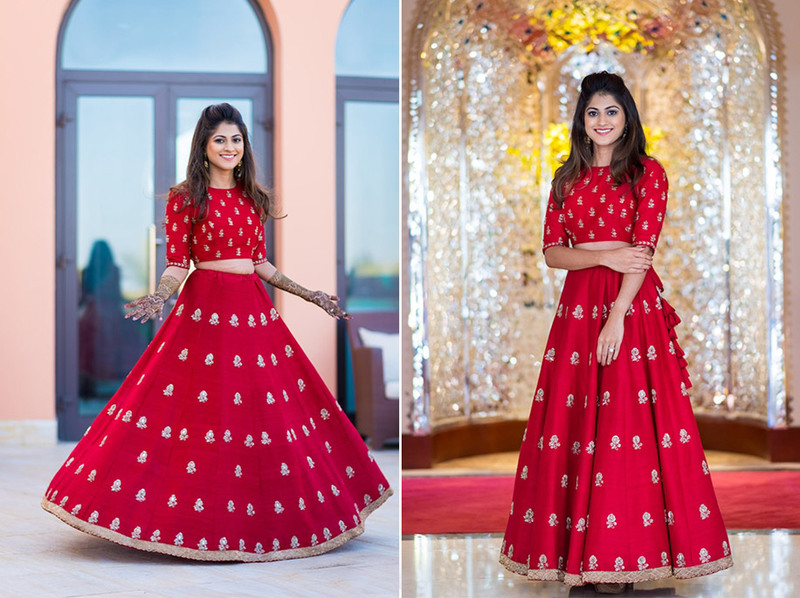 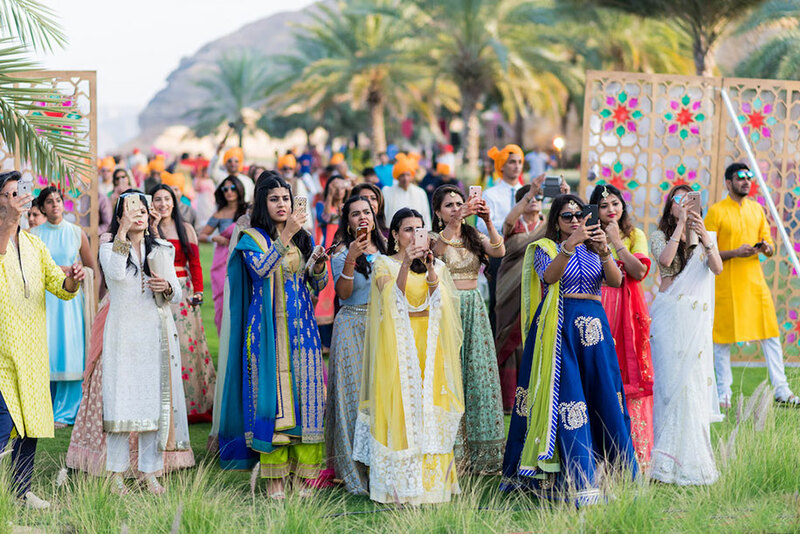 WeddingSutra.com is India's leading bridal media brand that provides comprehensive wedding information and inspiration to a target audience of smart, spirited, and sophisticated couples founded in 2000 by Parthip Thyagarajan and Madhulika Sachdeva Mathur. 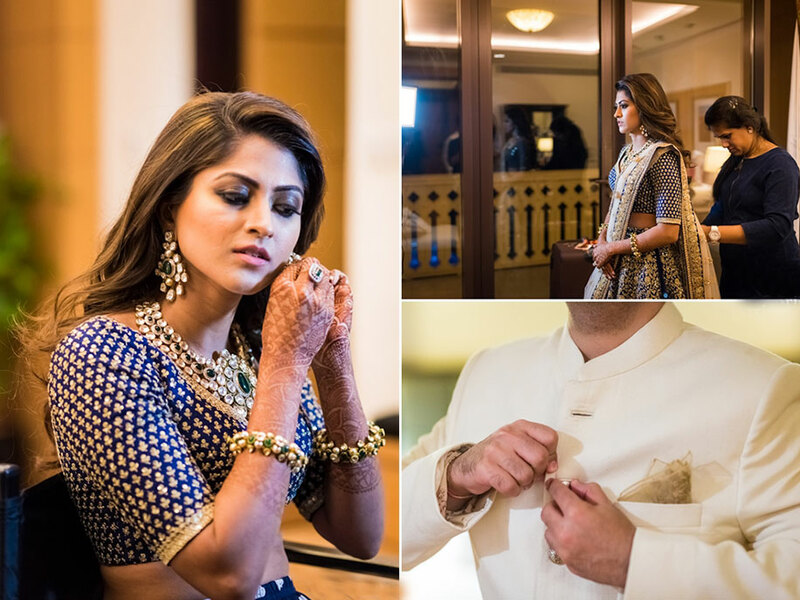 RHESON : The New Brand In Town.